Bishop Daniel E. Flores conducts a Mass to celebrate marriages from 10 to 60 years and over during World Marriage Day at the Basilica of Our Lady of San Juan Del Valle National Shrine on Saturday, Feb. 10, 2018, in San Juan. 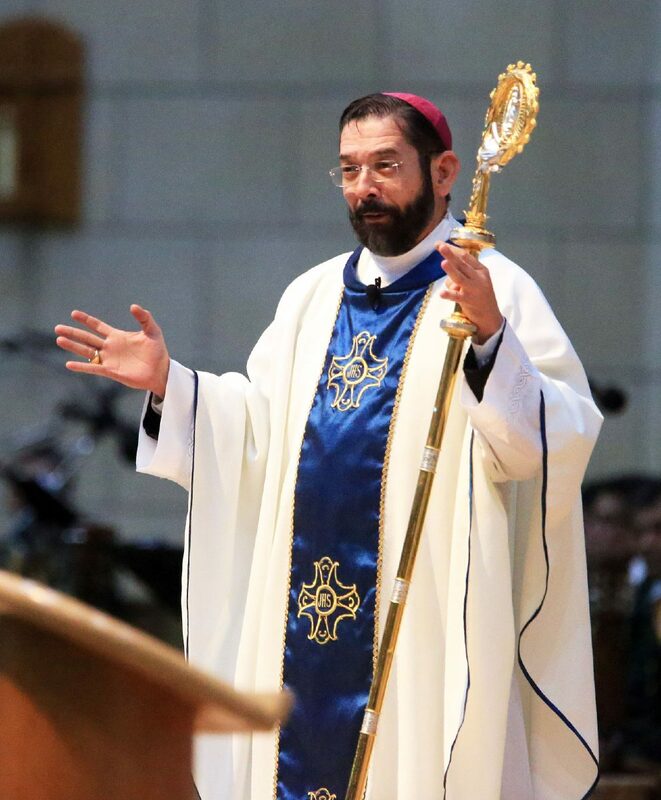 SAN JUAN — More than 200 couples from across the Valley reaffirmed their commitment to one another in a ceremony Saturday at the Basilica of Our Lady of San Juan Del Valle National Shrine as part of the annual World Marriage Day observance. The day has been celebrated on the second weekend of February for more than 20 years by the Catholic Church’s Worldwide Marriage Encounter movement to strengthen couple’s marriage vows. The Mass on Saturday honored couples who completed a marital milestone in 2018. Participants this year varied from couples celebrating 10 years up to 70 or more years of marriage. As the honorees entered the main entrance of the Basilica, they were given ribbons to wear signifying the length of their anniversary. 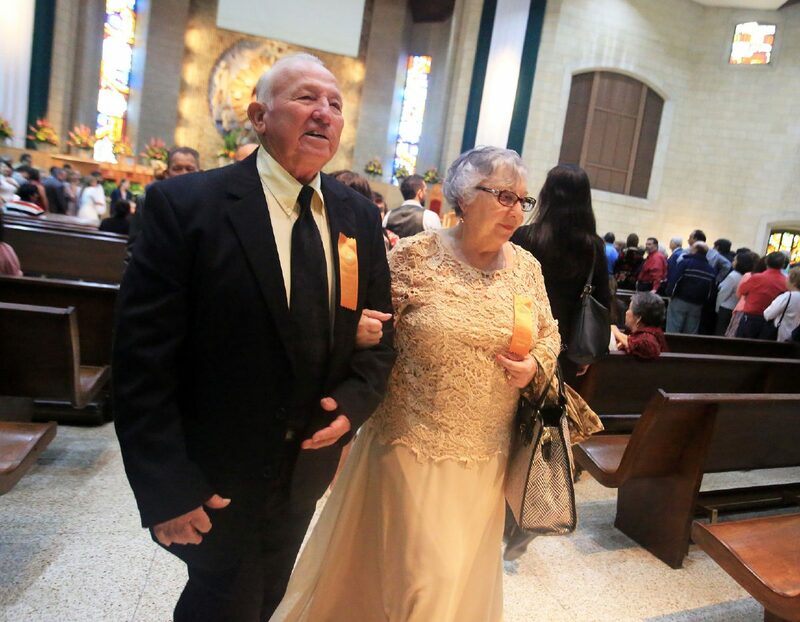 Sergio Lopez walks arm-in-arm with his wife Christina Lopez, whom he has been married to her for over 50 years, after a Catholic Mass to celebrate marriages from 10 to 60 years and over during the World Marriage Day Mass at the Basilica of Our Lady of San Juan Del Valle National Shrine on Saturday, Feb. 10. 2018, in San Juan. Carlos and Magdalena Ascencio are congratulated for 75 years of marriage by well-wishers after a Mass to celebrate marriages from 10 to 60 years and over during World Marriage Day at the Basilica of Our Lady of San Juan Del Valle National Shrine on Saturday, Feb. 10, 2018, in San Juan. Couples who celebrated their 10th anniversary wore a purple ribbon, those celebrating their 25th anniversary donned a tan ribbon, those of 30 years wore white, the pair celebrating 40 years wore red, the husband and wife celebrating a golden anniversary wore orange, marriages of 60 years wore green, and those couples completing more than 61 years wore blue. Bishop Daniel E. Flores of the Diocese of Brownsville led the afternoon Mass, congratulating them on their milestone. “We ask for a special blessing upon all of you that are here, of the family members those that are celebrating a special anniversary in particular, of such importance,” Flores said. “Marriage is like a full time obligation; it’s not a job, its part of our life,” he added. “Marriage is a mystery that is not always perfect because things open up; jobs change, situations happen, you have to move to a different house, new car; you have your first child then a second child comes along. It’s not something that is planned, and you can’t figure it out, but it happens and only God knows. “Marriage is a sign from the love of God,” he said. The unique ceremony included 94-year-old Emiliano Arevalo and his 90-year-old wife Juanita of Edinburg, who were celebrating their 72nd wedding anniversary. The couple was on hand because of their daughter, Norma Arevalo-Ramon, who encouraged her parents to be present and to celebrate another anniversary and another year of life. Another couple was 74-year-old Jake Perez and his wife, 78-year-old Veronica, whose 50th wedding anniversary was in December, but they waited until Saturday to celebrate. While most of the couples were celebrating a silver anniversary or greater, 31-year-old Katrina Gonzalez and her husband Uvaldo, 29, decided to take part in the celebration. 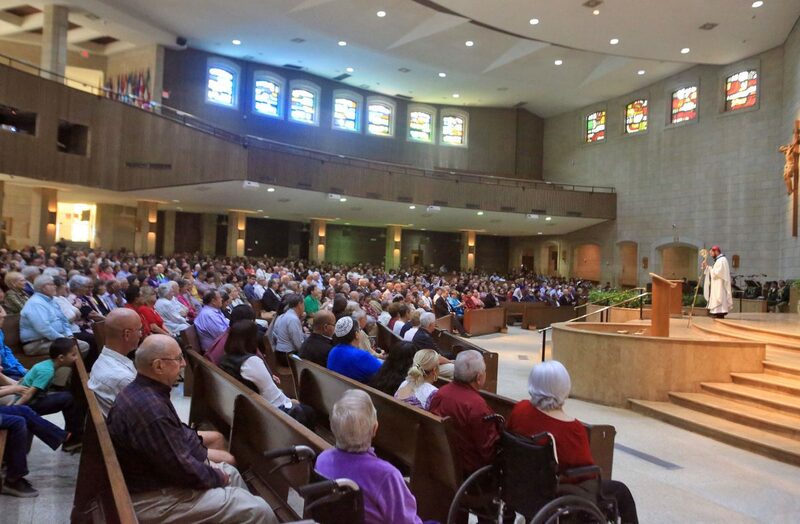 Toward the close of the ceremony, all the couples were asked to stand up for recognition by the worshippers and the bishop while a representative of the diocese’s family life office announced the milestone anniversary years. 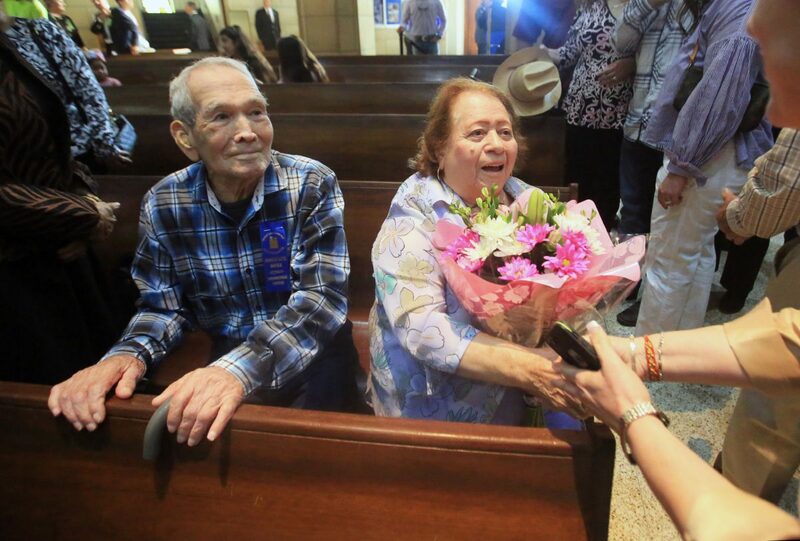 Couples who celebrated their 70th anniversary and beyond received especially loud applause with Flores presenting a dozen pink roses to the wives.